sometimes you just get lucky and photographers somehow discover your blog and send work your way. that opportunity to constantly discover new photographers and their talent is so wonderful and what carries the blog most of the time. is one such team. and i’m so fortunate to be able to have had them on the blog a few times and just following them via social media, you can see how much talent oozes out of them. so let’s learn more about Dallas and Sabrina. I’d been really into photography from a young age, but by the time Sabrina and I met I was pretty obsessed with it. Sabrina used to spend most of her high school time in the darkroom and was working as the in house photographer for a Vancouver art gallery, and I was photographing live music for a blog. 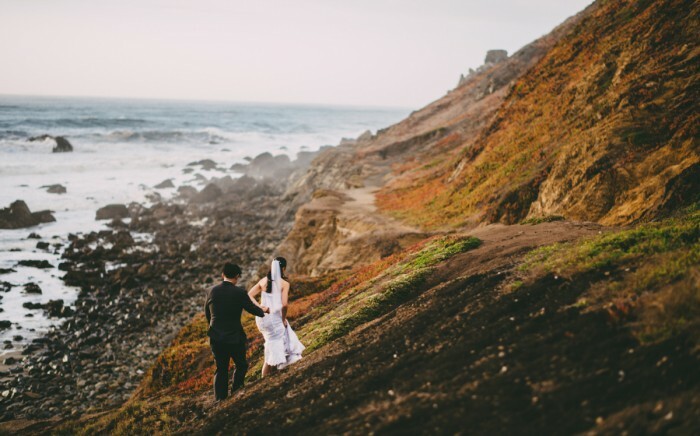 Shortly after we were married, Sabrina realized that I either needed to do this for work or I was going to have a very expensive and obsessive hobby, so she started building the business for me, but she never planned on shooting weddings with me. A week or so before our first wedding I told her I didn’t want to do it without her and basically forced her to shoot the wedding with me. She totally loved it and we started shooting weddings together that year. Our first few jobs were for friends, or to build our portfolio, and I was working a full time job as a house painter that year as well. By October of that year my work, which was seasonal, had all but dried up completely, and we weren’t sure how we were going to pay rent. We were a bit nervous for a few weeks, then our first booking season hit and by December we had enough weddings lined up for the upcoming year that I didn’t have time to work another job, so we both just jumped into wedding photography full time, and we have been shooting together ever since! When we first started in wedding photography we decided that we wanted to photograph our way, no cheesy, no fake, no forcing things. We didn’t want to replicate someone else’s work, or be a carbon copy of whoever is popular, we just wanted to photograph what we like. We weren’t sure if it would work out because wedding photography traditionally has a bit of a bad rep for being cheesy, and we weren’t sure if what we wanted to do was what people would want for wedding photography, but in the end we thought “let’s give it a shot, and if people don’t like it, then we’ll do something else.” What is unique about our style is that we focus on what’s real, we do full day coverage so that our couples don’t have to plan their day around our schedule, and that helps them to just be themselves and let us get the real shots that we love, and that they are going to appreciate in 5, 10 or 40 years. This one of Kim and Mario. These guys are an incredible couple and also good friends of ours. It was such an honour to photograph their wedding and we really wanted to push the envelope and create some epic photographs for them. 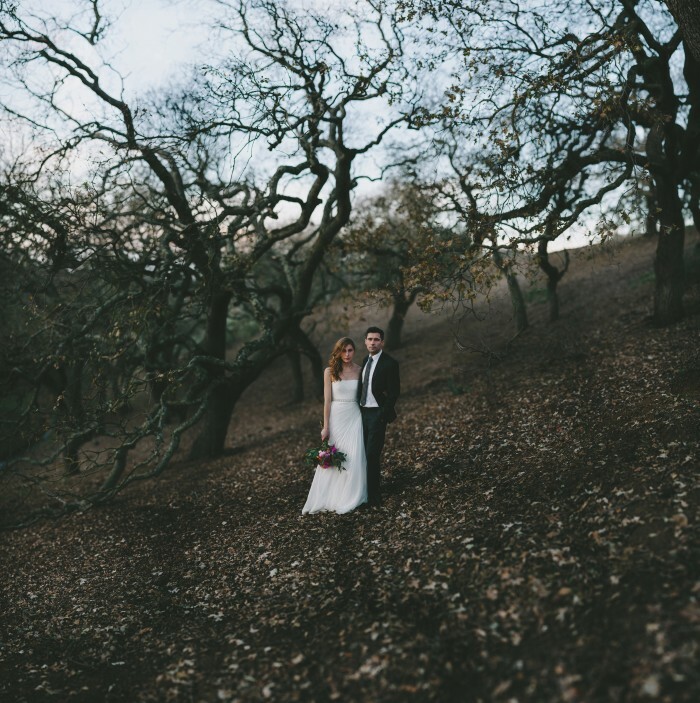 We always go scouting locations for all our couples before their wedding day, so we were hunting around everywhere for some really unique spots and we came across this forest that just made your jaw drop at how out of this world it looked, added to that an incredible couple made for some of our favourite photographs of all time. Dallas – I struggle with not getting into a rut when shooting. I’m naturally an easily bored person and when I do things repetitively I find that I start to just go through the motions. Sometimes I need to remind myself how awesome my job is, and that if I feel like there is nothing interesting, or no cool shots to be had, or whatever, it’s because I’m not looking and I’m not putting in the effort. Yes we are shooting weddings, but each wedding is unique and different and awesome in it’s own way, and sometimes I just need to remind myself of that. Sabrina – Caring too much of what others think. I often find myself anxious before we post a photo online or on social media but in reality who cares? Some people are going to love our work, others might hate it and the truth is I would rather it that way anyways. I feel a good piece of art should evoke an emotion, whether it’s good or bad, the worst is mediocrity. I envy Dallas for never caring what others think because I think it allows him to always be true to himself for what he wants to share with the world and that only comes around positively because it attracts like minded couples and we get to love creating more art that they love, it’s just a big snowball effect. I’ve honestly never given much thought to the idea “where is wedding photography heading next” because we just tend to do our own thing. We are just doing what we want to do. We don’t photograph based on what’s currently in vogue or what the industry pros say we should be doing, we try not to take others opinions of what wedding photography should be too seriously and we try not to be too influenced by popular voices just because that is how they work. I think that wedding photography is maybe becoming more recognized professionally, which is cool. I like where wedding photography is going for us, we are having fun and enjoying our job and the fantastic people we get to work with, so I guess I would like to see it keep going that way! Do your thing. YOUR thing. Dallas – What drives me as a person is learning new things. I watch a lot (A LOT) of documentaries, and I try to read as much as I can, I also love travelling and learning about new places and new cultures. It keeps me energized and excited. What drives me as a wedding photographer is simply getting good photos. I’ve come to realize that if I get photos that I really like, our clients are almost always going to really like them as well. Making our clients happy by giving them photos that they will cherish makes me pretty stoked, not to mention that I really really love making those photos as well, its a pretty sweet win win for me. Sabrina – I’ve always been an incredibly driven person but to be honest I really have no idea why haha. I’ve just always wanted to do and see as much as I possibly can in life and give it my all. I think probably trying my best to be balanced in life drives me in everything else. I find whenever you burn yourself out you can forget where your going and lose that drive. So staying balanced for me I would say, going for walks on the beach, taking a nap if I have to, going on daily adventures with Dallas, that keeps me driven as an individual and a photographer. Honestly, it is awesome to work together. Sabrina and I make a really good team, both in life and in wedding photography. We are able to communicate very well on wedding days, and we have a lot of mutual respect for each other personally and professionally. So many times I will see a certain angle or light or whatever and I’ll go and be shooting it and thinking to myself “What the heck is she doing over there??? Why isn’t she here getting this awesomeness??? Whatevs at least I’m getting it…” Then I’ll look at her photos and be like “WHAT THE HECK WAS I DOING OVER THERE??? Why wasn’t I where she was getting that awesomeness???? Holy smack those are AMAZING!!! !” But it’s good because we both see things differently, and we trust that we know what each other is doing. We have worked really hard on communication and that is one thing I would recommend to EVRERY team. You don’t ever want your clients to see you argue or be inconsiderate or rude to each other, but sometimes you need to let your partner know they are standing right in front of your lens and ruining your shot so please move now, hahaha. We find that just being polite and trusting each other has helped immensely. I know that if Sabrina is really focused on shooting, there is probably something awesome there that she is seeing, so even if I need to be where she is or move people or things or whatever, I either ask or just focus on something else and wait till she is ready, and she does the same for me. We trust each other as photographers, and that has helped us be a strong team. Dallas – After the first dance is over and I know I’ve got the shots, I’m always super anxious up to that point, then when it is over and I feel good its like the biggest weight off my shoulders. Even if we have a few more hours of shooting left, the day always feels finished for me after the first dance cause Im just partying in my head after it’s over. Sabrina – Cake! Lots of it. thanks so much to Dallas and Sabrina of Dallas Kolotylo Photography for spending time to answer these and to share their thoughts. i’ve definitely enjoyed learning about them more. while they’re based in Vancouver, Dallas and Sabrina travel worldwide. head on over to THEIR PORTFOLIO and THEIR BLOG to see much more of their beautiful work.